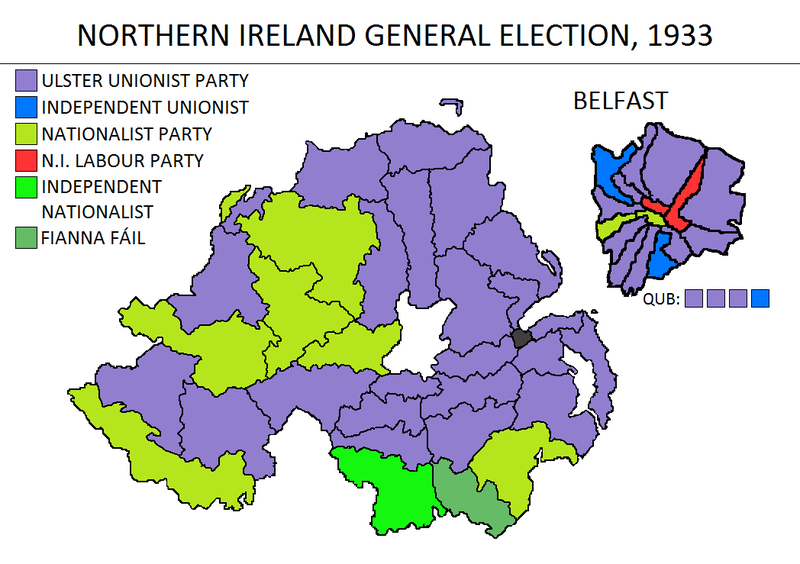 Beginning a trend that would last a number of decades, the 1933 general election saw nearly no change to the politics of Northern Ireland. The UUP remained the largest party, losing just one seat in Belfast. They returned 36 seats, exactly four times the number the Nationalist Party returned. The Northern Ireland Labour Party gained a seat, bringing their representation to 2. Independent republicans also made a breakthrough: Paddy McLogan won a seat in South Armagh, though he abstained from sitting in Stormont. The other notable event of this election was the victory in South Down of Fianna Fáil, the recently-formed republican party which operated primarily in the Free State. A year prior to this election, Fianna Fáil had won a majority of seats in Dáil Éireann and had formed a government. Even more interesting about their South Down victory was that the candidate was the party leader Éamon de Valera, a man who was simultaneously President of the Free State (the office would later evolve into that of the Taoiseach). Like McLogan, de Valera would also practise abstention. He did not retain his seat at the next election, marking the end of Fianna Fáil activity in Northern Ireland for 70 years.